Hi I'm Natalie and welcome to Talking Sport. Today we’re hearing about a Namibian sprinter and learning the word 'frustration'. The road to the Olympics isn't always easy. Some athletes train for years and still don't make it to the Games. Today Matthew Pinsent has been catching up with Merlin Diamond. Merlin is a sprinter from Namibia. So how has her training been going? Listen for the word 'frustration'. Merlin Diamond's road to London has not been easy. 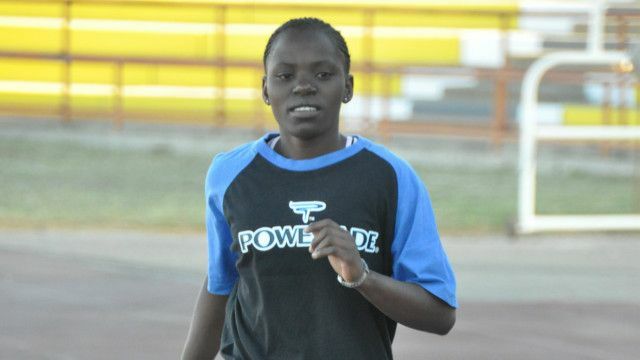 The 20-year-old runner spent much of 2011 at a training camp in Mauritius organised by the IOC. But injured with a pulled hamstring and homesick, Merlin found her preparations for London ground to a halt in the Indian Ocean. Back home in Namibia Merlin is feeling the frustration only stalled athletes seem to know. She's not running as fast as she used to or needs to, to qualify. Listen again for the word 'frustration'. So we heard Merlin's training programme was affected by her injury and she hasn't run as fast since. Did you hear the word 'frustration'? Well we have heard that Merlin has had difficulties training for this year's Olympics and we have learnt the noun frustration. Now let's hear from some people in London using the adjective form of this word 'frustrated'. I get frustrated when I can't afford expensive clothes. I get frustrated when I don't get a seat on the train. I get frustrated with traffic jams on the road. I'm Natalie and that’s all from Talking Sport. "But injured with a pulled hamstring and homesick, Merlin found her preparations for London ground to a halt in the Indian Ocean." Homesick is an adjective which describes someone who is missing home. Now complete the sentences with the correct phrase from above. The form of the phrase may need to be changed. 1. I think someone needs to tell her a few _______________ about what she has done. 3. After a few months at the company, I _______________ in my new job. "The 20-year-old runner spent much of 2011 at a training camp in Mauritius organised by the IOC." 1. The boss ______________ in this office. He is very strict. 2. Sometimes relationships ______________ and don't last forever. 3. He really did ______________that car ______________. It broke after three months. 1. I think someone needs to tell her a few home truths about what she has done. 3. After a few months at the company, I felt/was at home in my new job. 1. The boss runs a tight ship in this office. He is very strict. 2. Sometimes relationships run their course and don't last forever. 3. He really did run that car into the ground. It broke after three months.